One of the biggest concerns newly vegetarian and vegan mamas list is the fear their new diet may not provide them or their little ones with enough protein-rich foods. Some may even contemplate adding protein powders to their diet to make sure they get enough of this nutrient. As a registered dietitian, I’m here to tell you that it’s often unnecessary. In fact, many experts agree that a well-planned vegan diet based on whole, minimally-processed foods can provide you with all the nutrients you need (1, 2, 3, 4). All foods contain small amounts of protein but certain plant foods contain more than others. As a general rule, it’s better to get your protein from whole foods rather than supplements. That’s because foods contain a slew of beneficial nutrients supplements may not. Meeting your daily protein requirements as a vegetarian or vegan mama is simply a matter of knowing which protein-rich foods to incorporate to your diet. This article reviews 21 foods that contain good amounts of protein per serving, starting with the ones containing the most. Seitan is a protein-rich food made from gluten, the main protein in wheat. You can find seitan in the refrigerated section of most supermarkets or health food stores or, if you’re feeling inspired, can try making your own using this recipe. The interesting thing about seitan is that it resembles the look and texture of meat when cooked. It can be pan-fried, sautéed or grilled and is a handy option when hosting non-veggie friends or relatives. Seitan contains about 25 grams of protein per 3.5 ounces (100 grams), which wins it the title of richest plant protein on the list. It also contains good amounts of selenium and smaller amounts of iron, calcium and phosphorus (5). However, since seitan contains gluten, it is not a good option for mamas with celiac disease or gluten sensitivity. In sum: Seitan is a high-protein meat alternative with an interesting texture, which makes it a versatile addition to many dishes. All three of these foods are made from soybeans which are one of the rare plant foods considered a whole source of protein. Whole proteins provide the body with all the essential amino acids it needs. Most plant foods are low in at least one essential amino acids, but soybeans contain good amounts of all of them. Edamame are immature soybeans with a sweet and mildly grassy flavor. They need to be steamed or boiled before you can eat them but are very versatile. You can eat them on their own with a dash of salt or incorporate them into soups, stews, woks or salads. Tofu is made from soybean curds pressed together in a way very similar to cheesemaking. It doesn’t have much of a taste but easily absorbs the flavor of the foods, spices or sauces it is prepared with. Tempeh is made from cooked and slightly fermented soybeans pressed together into a patty. It has a characteristic nutty flavor and a slightly more compact texture than tofu. All three contain around 10-19 grams of protein per 3.5 ounces (100 grams) in addition to some iron and calcium (6, 7, 8). Tempeh is also a good source of probiotics, which keeps the gut healthy and the immune system strong (9, 10). In sum: Tofu, tempeh and edamame are three protein-rich foods made from soybeans. All three that provide a complete source of protein. Lentils are an often under-used source of protein. They can be incorporated to a wide variety of dishes including spreads, meal salads, soups and Indian-inspired Dahls. And at 18 grams of protein per cooked cup (240 ml), they definitely earn their spot on this list of protein-rich foods. Lentils are also good source of complex carbs. One cup (240 ml) provides around 50% of your recommended daily fiber intake. The type of fiber found in lentils also provides food for the healthy bacteria in your gut, keeping your digestive system in top shape (11). As if that wasn’t enough, lentils are also rich in folate and iron — two nutrients especially important for mamas and mamas-to-be. They also contain good amounts of antioxidants and other health-promoting plant compounds (12). In sum: Lentils are not only rich in protein, they also contain a slew of other beneficial nutrients, making them a worthwhile addition to your diet. Chickpeas, sometimes known as garbanzo beans, definitely deserve a spot on the list of protein-rich foods. Together with most varieties of beans, they contain around 15 grams of protein per cooked cup (240 ml). In addition, both chickpeas and beans are excellent sources of complex carbs, fiber, iron and folate. They’re also rich in phosphorus, potassium and a slew of beneficial plant compounds (13, 14). 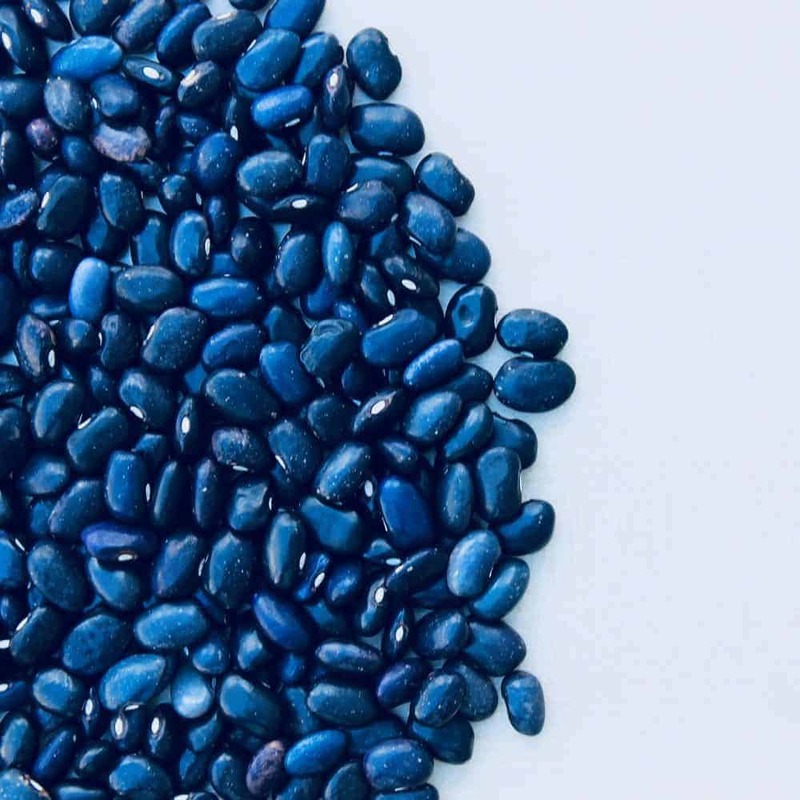 Interestingly, diets rich in these legumes are often linked to lower cholesterol, blood pressure and blood sugar levels as well as less belly fat (15, 16, 17, 18). So it’s well-worth snacking on some home-made hummus or roasted chickpeas. Or putting that home-made chilli on this week’s menu! In sum: Chickpeas and beans are not only rich in protein, but also rich in hunger-reducing fiber and health-promoting vitamins and minerals. Nutritional yeast can be found on supermarket and health food store shelves in the form of a yellow powder or flakes. It is made from a deactivated strain of Saccharomyces cervisiae. It has an interesting cheesy flavor which makes it a popular addition to dishes ranging from vegan mashed potatoes to scrambled tofu. Nutritional yeast is actually one of my favorite protein-rich foods. I particularly love to sprinkle a handful on pasta dishes or homemade popcorn. It contains about 14 grams of protein per ounce (28 grams) and is another of the rare plant sources of complete protein (19). When fortified, nutritional yeast is also an excellent source of other vitamins and minerals including vitamin B12 (20). These two ancient grains provide around 10 – 11 grams of protein per cooked cup (240ml). This makes them the grains highest in protein (21, 22). Both are also good sources of vitamins, minerals, fiber and complex carbs. Plus, they’re versatile alternatives to more common and lower-protein grains such as wheat and rice. You can teff and spelt in many recipes, ranging from polenta to risotto. Their flour can also be used to amp up the nutritional value of many baked goods. As a bonus, teff is a gluten-free. This is a great option for vegetarian and vegan mamas with celiac disease or gluten sensitivity. In sum: Teff and spelt are two protein-rich foods that provide a good alternative to more common grains. Although perhaps less popular as other types of seeds, hempseeds are well-worth getting to know. At 10 grams of protein per ounce (28 grams), they contains at least twice as much protein than all other seeds, including chia and flaxseeds. Just like soybeans and nutritional yeast, hemspeeds are another of the rare plant-based protein-rich foods offering a complete protein profile (23, 24). Hempseeds are also rich in iron, zinc, calcium, magnesium and selenium. And as if that wasn’t enough, they also contain omega-3 and omega-6 fatty acids in the ratio considered optimal for your health (25). You can sprinkle some on pretty much anything, from your morning muesli to your smoothies, side salads, pastas or soups. In sum: Hempseeds provide another source of highly-digestible protein. They also contains good amounts of other important nutrients as well as the optimal ratio of omega-3 to omega-6 fats. Although typically served as a side dish, green peas hold their own when compared to other protein-rich foods on your plate. They contain about 9 grams of protein per cooked cup (240 ml) which is slightly more than a cup of cow’s milk (26). This amount of peas also cover more than 25% of your daily requirements of fiber, thiamin, folate, manganese and vitamins A, C and K (27). In sum: Although they’re perhaps not the first protein-rich food that may come to mind, green peas pack a surprisingly high amount of protein. Spirulina is a green-blue algae with a pretty distinctive taste. Two tablespoons (30 ml) of spirulina powder will provide you with about 8 grams of complete protein and around 22% of your daily iron needs (28). Spirulina also contains disease-fighting antioxidants, essential fatty acids and other beneficial plant compounds (29, 30, 31). The best way to try it is probably to add it to your smoothies. But if you’re not accustomed to this strong-tasting powdered algae, it may be best to start with a very small quantity and work your way up. In sum: Spirulina is a nutritious, protein-packed algae supplement with health-enhancing properties. Amaranth and quinoa are two “pseudocereals” that are often grouped together with other grains, although they don’t technically grow from grasses like other cereal grains do. At 8-9 grams of complete protein per cooked cup (240 ml), they provide more protein than most other grains and pseudocereals (32, 33). You can use them as a nutrient-rich alternative to other grains, including rice, couscous and pasta. They’re perfect either as a side dish or your meal’s main attraction! In sum: Amaranth and quinoa are two additional protein-rich foods. They’re both considered sources of complete protein and are an easy substitute to more traditional grains such as rice and wheat. Ezekiel bread is made from sprouted whole grains and legumes, two protein-rich foods. Two slices provide around 8 grams of protein — which is just a bit more than the average sliced bread (34). The interesting thing about sprouting grains is that it boosts the amount of healthy nutrients they contain while reducing their anti-nutrient levels (35, 36). Anti-nutrients are compounds found in some plant foods which make it more difficult for your body to absorb the nutrients they contain. So reducing their levels is definitely a good thing! Sprouting may also slightly reduce the amount of gluten found in grains, which can make them more easy to digest for mamas sensitive to gluten. In sum: Breads made from sprouted grains contain more protein, vitamins and minerals and are more easy to digest than more traditional breads. Soymilk is a great alternative to cow’s milk. It contains about 7 grams of protein per cup (240 ml) and, when fortified, is an excellent source of calcium, vitamin D and vitamin B12 (37). You can drink soymilk on its own, use it to make your morning cappuccino, add it to smoothies or use it when cooking or baking. Just keep in mind that flavored soymilk often contains high amounts of added sugar. For this reason, it’s best to opt for an unsweetened variety. If unsweetened isn’t your jam, feel free to add a small amount of sweetener like maple syrup or sugar at home. You’ll likely still end up consuming less added sugar than if you had purchased the flavored variety. In sum: Fortified soymilk is a protein-rich and versatile alternative to cow’s milk. Wild rice contains around 7 grams of protein per cooked cup (240 ml). That’s around 1.5 times more protein than other long-grain rice varieties, including basmati and brown rice (38). Plus, it has a pleasant slightly nutty flavor, a good crunch and looks ultra pretty on your plate! As with most grains, you should rinse it thoroughly before cooking to remove any impurities. Washing the rice before cooking it can also help reduce its arsenic content by more than half (39). In sum: Wild rice makes the protein-rich foods’ list as a tasty and nutrient-rich alternative to other types of rice. At 6 grams of protein per half a cup (120 ml) of dry oats, this cereal can add good amounts of protein to your vegetarian or vegan diet (40). Oats are also a good source of soluble fiber. This type of fiber helps reduce hunger and keep you fuller for longer which can be handy when you’re busy running around after your little ones (41). This cereal can be used in a variety of ways, whether to make the traditional morning oatmeal or to improve the consistency of your veggie burgers. Oats can also be easily ground into a flour for those times when you need a gluten-free flour to make cookies or pancakes for your gluten-sensitive guests. In sum: Oats are a protein-packed popular grain, easy to incorporate into any plant-based diet. Chia seeds are native to Mexico and Guatemala but have definitely taken the rest of the world by storm. And for good reason. At 6 grams of protein and double that amount of fiber per 1.25 ounces (35 grams), they’re an easy way to incorporate both of these two nutrients to your diet (42). These little black seeds are also rich in iron, calcium, selenium and magnesium and contain good amounts of antioxidants and omega-3 fatty acids (43, 44). They’re super easy to sprinkle on a variety of dishes. Plus, they have the ability to turn into a gel-like substance once they absorb liquids. This is particularly handy when trying to make puddings or to substitute eggs in certain recipes. In sum: Chia seeds join the list of protein-rich foods as a versatile way to add protein, fiber, vitamins, minerals, good fats and antioxidants to your diet. Nuts, seeds and their butters are a final way to add protein-rich foods to your diet. Most contain around 5 – 7 grams of protein per ounce (28 grams) (45, 46, 47, 48, 49). Nuts and seeds also contain good amounts of fiber, iron, calcium, magnesium, vitamin E and good fats. Moreover, they can provide you with a fair share of antioxidants and other beneficial plant compounds (50). The thing to keep in mind when purchasing nuts is that blanching and roasting can reduce the amount of nutrients they contain. So raw unblanched varieties are often best (51). Also, it’s best to steer clear of brands that add sugar, oil or salt to their nut butters and pick varieties that contain your nut or seed of choice as the sole ingredient. Nuts should be stored in the refrigerator or freezer to help prolong their shelf-life. In sum: Nuts, seeds and their butters are an easy way to add protein, fiber, good fats, vitamins and minerals to your diet. Maximize their benefits by sticking to the least processed varieties. 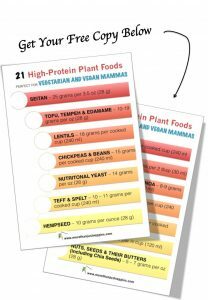 Getting enough protein in your vegetarian or vegan diet is a simple matter of adding the right plant-based protein-rich foods to it. All plant foods contain protein to some extent. The ones listed in this article provide between 5 and 25 grams per portion. This is considered great amounts in the plant world! Try to add a protein-rich food to each of your meals and snacks and you’ll be on your way to meeting your daily protein requirements in no time. Do you want to print this list up and hang it on your pantry? Or share it with your vegan neighbour? Get a free printable copy below! You'll receive exclusive dietitian-vetted (and mom-proof) nutrition tips directly in your inbox. I take privacy seriously so your email won't be shared with anyone else!